Villa est sur Southern Dunes Golf and Country Club qui a été classé 6e en Floride. La villa est dans un complexe très calme avec 24 heures de porte habités, tout ce que vous avez besoin après une dure journée dans les parcs à thème ou une longue journée de shopping détente à votre propre piscine privée. Je recommande si vous allez aux installations ci-dessus et allez sur le site de mon villas elle Vous aurez plus d'informations sur villa. Aussi, quand sur le site Aller au calendrier mis dates il vous donnera un prix si son pas réservé, vous pouvez alors livre villa sur le site ainsi. Salle de bains attenante à la principale chambre a salle de bain / douche, lavabo, WC. 2ème salle de bains a une baignoire / douche, lavabo, WC. for a great stay. All the furniture, beds, living room, were very comfortable. Although we did not choose to heat the pool it looked very clean. Awesome would recommend ! Enjoyed our stay at this southern dunes villa! 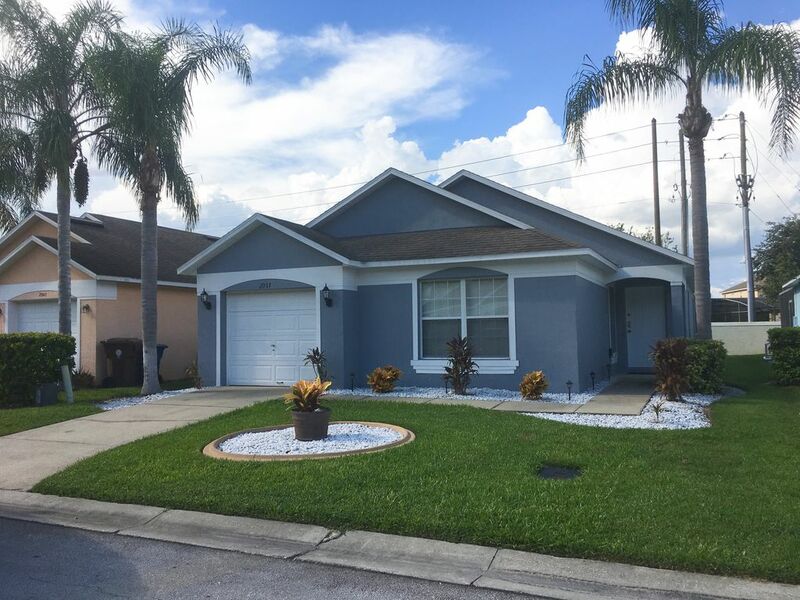 I was a bit apprehensive after reading the reviews but have just returned after our stay & can honestly say that the villa has everything you need for a relaxing, enjoyable stay in Florida. Had to contact owner a few times & also decided to extend my stay & Paul was quick to reply & very helpful every time. The villa is a lot larger than I expected from the photos so there was loads of room for my husband & I. Comfy bed in master bedroom with smart tv. The other bedrooms were large with TVs & plenty of storage. The living/kitchen/dining area was open concept which I liked. Was bit unsure about the villa being north facing because of sun at pool area but even though the sun only hits the back of the pool we were able to Sunbathe for few hours a day & i would imagine at the height of summer the shade would be a welcome relief. Southern dunes is gated community which makes it feel secure & has super Walmart at entrance with a selection of restaurants & take-aways within 5 min drive which is ideal. While staying this time we visited a lot of other communities as I’m looking for a larger villa for a family holiday for next stay & I can honestly say that southern dunes is amongst the top of the pick because it is a well maintained community & you can tell that everyone takes pride in the look of the villas & gardens. A bit leery after reading one of the reviews, my husband and I still decided to stay at this home for a week in October, and were entirely happy that we did. We were in Florida solely for rest and relaxation. All the home appliances worked very well. The LR couches and our bed were extremely comfortable, and there were even tv's in all bedrooms. Being from Canada, we greatly appreciated the free calling to keep in touch with family back home. All of our meals were cooked at home, and everything needed to do that was in the cupboards. We lacked nothing! For sitting poolside, there's a good selection of plastic cups for both adults and children. Southern Dunes is a gated, very pretty community to walk around, watching the golfers or just enjoying the landscaping and beautiful birds. We took a 30 minute scenic drive south down hwy 17 to Bok Tower Gardens, a peaceful, beautiful place with meandering walkways, gorgeous landscaping, and spectacular views. Bells chime from the tower every 1/2 hour. We headed there thinking we'd spend an hour but stayed on for many more. There is a flea market about 15 mins south from "home" on hwy 27, where we picked up a few items including fresh fruit. That hwy is also a quicker route to Bok Tower Garden if you don't take the scenic hwy 17. WalMart, Dollar Tree, Winn-Dixie and endless restaurants are right outside the security gate, a 2 minute drive from the house. Couldn't be easier! We had fun playing fooseball and there is a dart board as well in the garage. The owner lives in the UK but responds to emails in a timely manner. Just note that it is 5 hours later in the UK so be respectful of that. If there are immediate concerns (we had none), there are numbers provided for someone close by. Please remember this is someone's 2nd home. Especially having renters (some very careless), some small cosmetic things will happen. I made mention of a few minor details to the owner which he appreciated learning so he can have them addressed. If things like a bit of scuffed paint is something you can't live with, find a brand new home to rent. We found this to be a very comfortable lovely home. The screened in pool is on the north side of the home - great for us as we had temps in the mid 90's (mid 30's Celsius), offering us shade and comfort (and no bugs!) while we read books. There is a good selection of them found in the LR - much appreciated! Thanks Paul for providing everything we needed for a perfect week. The property was worn and maintenance deferred. It felt dingy. Our major complaint centers on cleanliness, the floors were dirty (light grey grout was black) areas around air vents showed significant dirt. The mattress in the master was pretty bad and my wife and I had to sleep apart. The major appliances all need to be replaced. Many of the pots and pans had loose handles and scratched Teflon. Not well equipped for long term stays, inadequate cleaning supplies, etc. We were there for a full month and bought items to clean and cook. Overall we enjoyed the area but this property needs a complete makeover to feel more like a vacation rental than an inexpensive motel. We really think our cleaning fee should be refunded. Everything was nice clean and well maintained. 90 mins Daytona et Coco plages de la côte Alantic. 90 minutes Clearwater et St Petes plages de golf côte. Il ya beaucoup plus de plages fantastiques en voiture avec des plages d'un blanc pur. Avec tous les endroits à visiter - les plages, les parcs à thème, faire du shopping une voiture est indispensable. 40 minutes de l'aéroport international d'Orlando. 50 minutes Tamper aéroport international. 70 mn de l'aéroport Sandford. Voir le lien pour les directions de voyage. 40 Orlando centre ville 40 min. Tampa centre ville 50 min. Les parcs à thème 20 mins. Situé directement complexe de côté sont deux pharmacies et un énorme Walmart qui vend pratiquement tout ce qui sont ouverts 24 heures. Il ya beaucoup de restaurants et de prendre aways ouverts tard dans la zone locale.